The Jagdtiger (Hunting Tiger), also known as the Panzerjäger Tiger B, was a heavy tank destroyer based on the King Tiger tank. 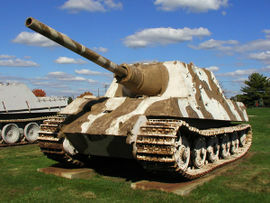 In World War II, Germany had success using the chassis of their existing Panzers as the basis for self-propelled weapons (SPWs). After the success of the Jagdpanther tank destroyer, it was decided to mount the large 128 mm PaK44 L/55 gun on a lengthened King Tiger chassis. The superstructure was box-like in appearance with sloped sides. The frontal armor was thick and also sloped. The result was a monster heavy tank destroyer which could out-range any others. However, the main gun mount had a limited traverse of only 10 degrees; therefore, the entire tank destroyer had to be turned to fire at enemy targets which were outside that limited field of fire. It was manufacted by Nibelungenwerke from July 1944 until March 1945. It had a crew of 6. Secondary armament originally consisted of one MG 34 machine gun in the hull; later some had a second MG 42 machine gun added to the engine deck. The Jagdtiger was powered by a V12 gasoline engine and had a top speed of 21 MPH. It weighted 70 tons making it slow and unwieldy. It had many of the same production and spare part problems as the King Tiger tank. It saw combat service in the fall of 1944 and thereafter in the defense of Germany. A total of 150 were ordered. However, including prototypes, only between 77 and 88 were produced by the end of the war in Europe. Chamberlain, Peter. Encyclopedia of German Tanks of World War Two, (1999). This page was last modified on 21 July 2016, at 09:12.